This recipe appeared in the Winter 2007 issue of Texoma Living!. In a small pan over medium heat, cook Chef Cathy’s Mango Salsa with the jalapeno jelly, stirring occasionally. Cook for 5 minutes or until all the jelly is melted. Place mixture into a plastic bowl and cover. Chill for 2 hours. Cut slices of cheese into quarters. Place cheese quarters onto a serving tray overlapping the slices. 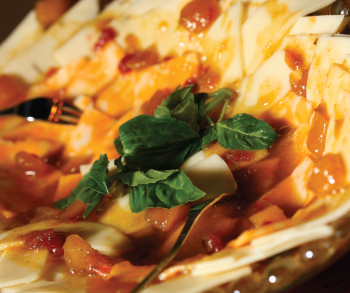 Spoon the salsa-jelly marinade over the cheese. Do not cover completely. Place fresh basil sprig in the middle of the tray. Serve and enjoy! Dairy Queen is a Texas Tradition. It’s not a Texas town without one,” said Lawton Langford. He is a longtime DQ fan from Bonham, where the DQ building now stands empty. There hasn’t been a Dairy Queen in town for years.